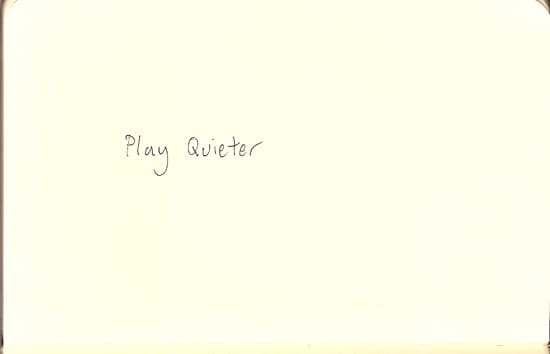 How do you get a guitarist to play quieter? Send him to Holland. So, I’m torn between two things. On the one hand, I love what a guitar can do when you crank it – all the expressive sounds you can make when you’ve got a responsive guitar turned up loud. But on the other, I don’t enjoy listening to really loud music. What I do love is listening to music where you can bask in the sound. Recently, I had a gig at the Hague Jazz festival, and after we played we went to check out the other bands. All the bands I heard were pretty loud and there was an awful lot of heavy bass drum – ‘BOOM, BOOM, BOOM!’. The ones where the sound system wasn’t that great, or the room acoustic wasn’t flattering, were unlistenable. The last band I heard did it differently though. Eefje De Visser’s band made a beautiful sound. They played really well together. The arrangement were interesting with unusual instruments/sounds and beautiful melodies. But the thing that I really warmed to was that the volume was quiet. They were still going for it, playing pop songs with gusto, but their sound felt like they wanted you to be drawn in. Anyhow, here’s their album. I like it.